What is the reason the results of our tests and exams turn out not as we expected them to be? Of course, that doesn’t apply to the case when you get a highest mark for the essay you wrote at 4 a.m. because we don’t discuss supernatural here. The point is, why do the study guides we rely on do not yield the results we expect out of them? 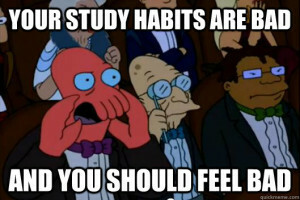 Turns out, no one could definitely say which habits are good for both memorizing and grades and which are not; it was mostly urban legends. 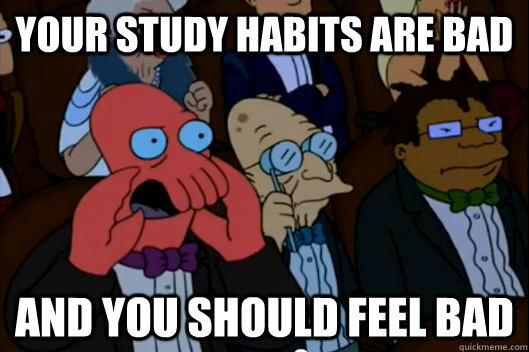 But now we can rely on the trustworthy research and bust some of the most widespread myths about studying habits. Myth One. Find a quiet location (like your favorite chair in the library or that comfortable corner near the window) and stick to it when studying. Turns out the brain does not entirely focus on the material you’re trying to keep in your memory at this point, but also paying attention to the outside world as well, which is not surprising. It is subconsciously making the associations with the environment and creating the links with that color of the coffee shop wall or a tree in the yard. The information is not being tied only to one setting, and brain does not struggle to connect everything with it, but keeps receiving new pieces of data that differ from each other and are unique what makes them less forgettable. It’s basically like comparing daily routine and holiday: you definitely won’t forget something new and colorful. Myth Two. Always focus on one type of task only. Many of us students know that feeling when seeing the problem at the exam and having no idea how to solve it. Technically, we know how to solve the parts of the equation separately, but we’re not trained that much to give answers mixed problems. It’s like studying the leaves of a tree and never seeing the whole tree. Turns out our brain learns to understand what’s similar and different among the parts of the whole mixed set, compare them, and work out the strategy for solving or distinguishing the parts. Mixed problems are always different, while easy equations are simple and all look like each other, and solving tests with mixed sets involves developing creative approach to the task and decomposing it to parts, not sitting in confusion with knowledge of only simple strategies. Don’t skip your “leg day” and get a proper, complete workout of your abilities. Myth Three. Study something particular for a long time until you remember it well. The ability of your brain to learn something new deteriorates at the same pace with the time spent on studying in one sitting. When you’re spending a couple of hours here and a couple of hours there on studying some topic, you have to revise all the material each time you study, and more revising allows the brain to repeat and relearn the things you might have forgotten from the last times. Myth Four. Testing is a bad tool of studying. The standardized testing might be pretty hard, and remembering the answers to particular questions is really difficult. The thing is, no matter how bad the connotations that people have with tests are, the fact remains: the harder it is to remember the fact, the harder it is to forget later. You may still know the significant dates from the times of the Second World War many years after you passed all the tests. Practicing tests might become a powerful tool for remembering things. Myth Five. People differ a lot by the learning styles. Research has shown that there isn’t much correlation between effective usage of particular approaches like “auditory” and “visual” with students who call themselves “left-brains” and “right-brains”. In fact, people just might get used to a certain approach, or not like a teacher or way the information is provided. The results from both “auditory” and “visual” learners when using one approach almost did not differ. You’re finally free to use any materials you want and not worry about being bad in one of the directions. So let’s put it this way: no studying techniques, even the ones that are supported by the reliable research, are able to make you a pro in one night. Motivation is what matters, and do not underestimate the value of rest and communication with friends. Does your room have that dusty shelf with old college textbooks that you no longer use? Get some cash easily and quickly by selling them on BooksRun.com! You can also download our barcode scanner apps for Android and iPhone! Previous Post Keep Calm and Sell Your Textbooks!